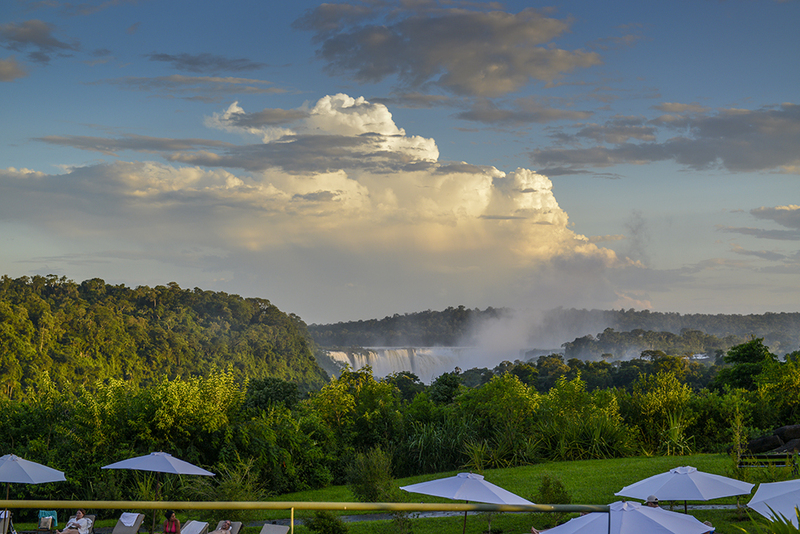 Iguazu Falls was the final destination of our journey south last month. This is one of the great waterfalls on our planet, wider and taller than Niagara Falls and, because it is actually a combination of many separated falls, second in width only to Victoria Falls in Africa. Victoria has an uninterrupted curtain of water one mile wide. But the one waterfall that would dwarf all others, if it still existed, is the virtually unknown Dry Falls in the state of Washington, USA. With a width of 3.5 miles and a height of 400 feet, it once carried ten times more water than currently flows through all the rivers of the world. But that was more than 10,000 years ago. 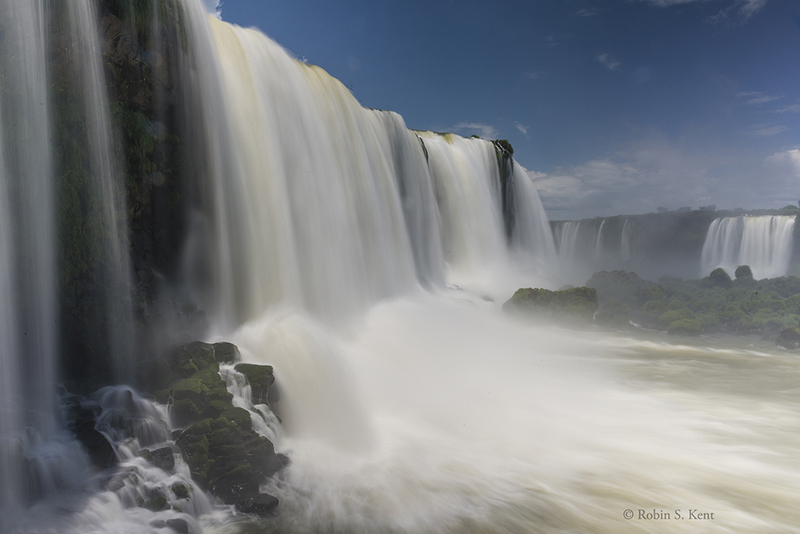 Iguazu Falls cannot be seen all at once unless you are riding in a helicopter. In fact, you have to travel to another country to see a significant portion. 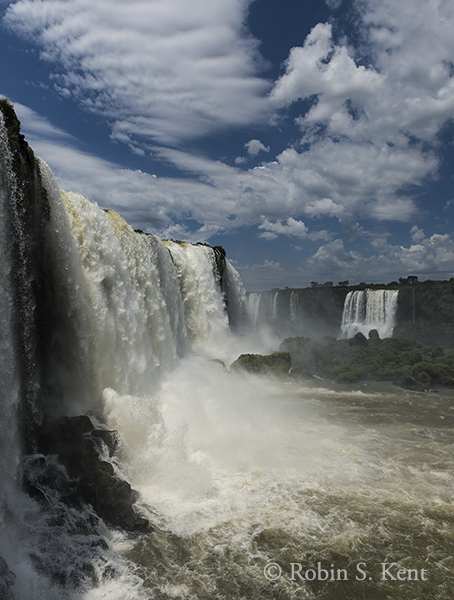 The main feature, the Devil’s Throat, is in Argentina but some spectacular sections are in Brazil. To appreciate the scale, one should experience both. Access to most of the sections is not difficult, as long as you don’t mind walking a fair distance in very hot and humid conditions. It didn’t help that the tour gave us very little time to explore the spectacle, let alone devote enough time to photograph it. I’ll refrain from describing all the logistical lessons we learned, but anyone who has questions can raise them as a comment and I’ll do my best to answer them. 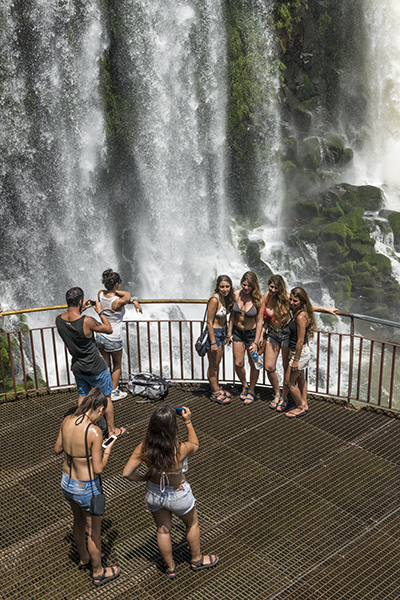 As the images suggest, the walkways take you very close to the edge of the falls. The lack of any reference objects makes it difficult to gauge scale. 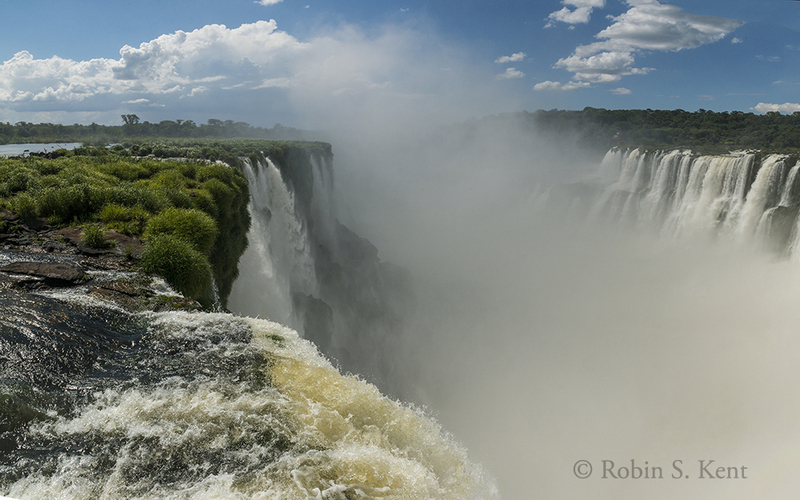 The falls facing each other above are actually part of a continuous loop that goes around behind the camera. I would guess it is at least a 200-foot drop in the view here. To give you a sense, the image is a photomerge of 4 separate images taken with my wide angle zoom at 26mm. OK, the above image is not a waterfall. But on our way over to the Brazilian side of the falls the tour company included a stop at a bird “sanctuary.” It was actually OK if you didn’t desperately want to see (and photograph) Iguazu Falls. to here, the lower viewing platform. The dress code here is somewhat different from Antarctica. From the photographer’s right, there is a ramp that takes you to other viewing locations but I decided to concentrate on this spot. The above image is a 2-image photomerge taken from about the same spot as the 4 young women in the previous image. Again, this is a wide angle image (24mm). For the majority of these images I was using a high shutter speed (1/5,000th sec. above). But since I had a tripod and a variable neutral density filter, a time exposure seemed like it might also be interesting. I would have liked to stay and continue taking pictures but the bus back to Argentina was about to leave so it was time to go. 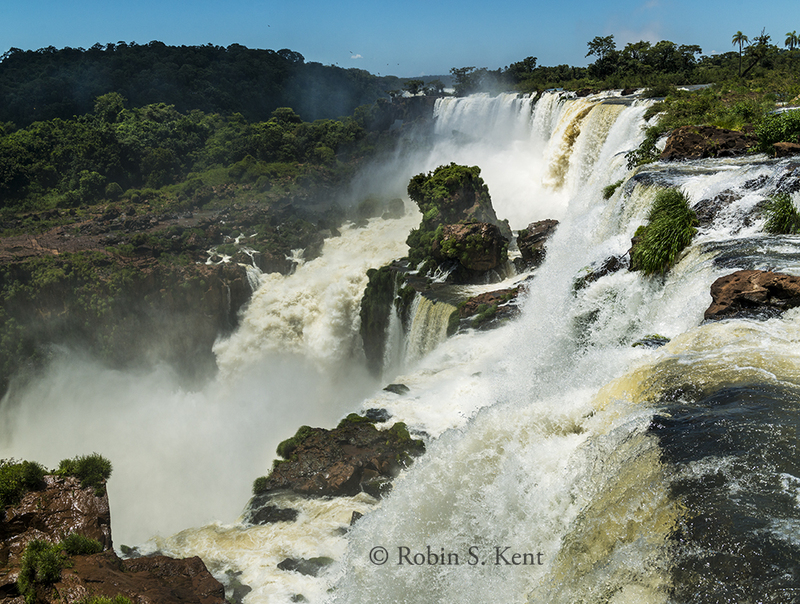 This entry was posted in Argentina, Brazil, Landscapes, Travel and tagged Argentina, Brazil, landscape photography, Nikon, travel, waterfalls, what to see, Where to Go by Robin S. Kent. Bookmark the permalink. Beautiful falls. I like the timed exposure best. I’ve always liked the silky feel of water over a long period. When I was in Croatia a few years ago, we went to Krka National Park to see the waterfalls. Like you, we didn’t have near enough time to properly photograph them! Thank you for the comments and for visiting. Yes, this part of the trip had its frustrations, but at least it wasn’t raining. Since I haven’t heard of that park in Croatia, I did a quick check of the Krka waterfalls, and it seemed like a lovely place. I can see why the limited time there would make one grumpy. Hi Robin, how exciting to visit here, I love the long exposure, the softness of the water. The hard part about travelling with others is the concessions you make to the schedule, how long and even the time of day you visit a place. But on the plus side of the discussion, you went, you saw, you had a great experience and now have amazing photos to come home with! thanks for sharing them with us. Thanks for commenting and you are correct about looking at the positive. A group tour restricts your freedom, but it was the only way we could have done this. There really was no other option so as we often say, play the hand you’re dealt and usually things will turn out OK, as they did here. 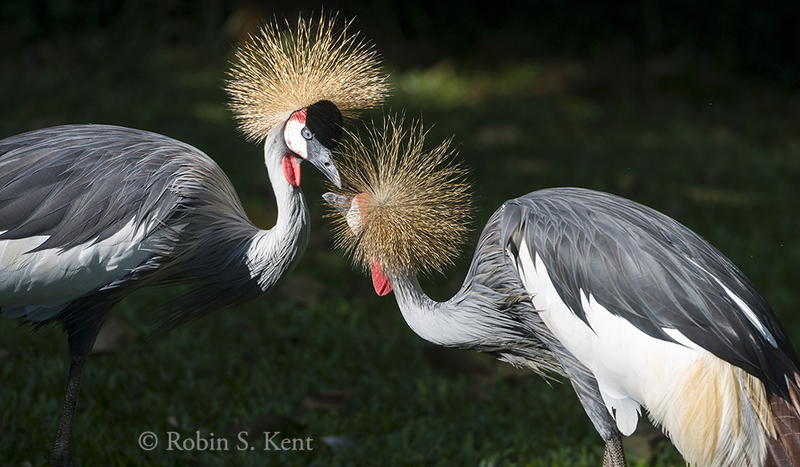 Beautiful photos, Robin. You have captured a great power and force of these falls, the long exposure shot is great, it was definitely worth taking your filter and tripod! Thanks very much, and I was really thankful about having that tripod even if the others on the bus gave me strange looks. Those waterfalls are amazing Robin, I can imagine they were also very loud, I can hear the sounds as I look at the photos. Really spectacle. Thanks very much, Leanne. Good to hear from you. You are right about the loudness, especially when one was close to the water. And we could hear them from the hotel, about a mile away. This was the final post on this trip so I have been organizing some thoughts per your suggestion for a kind of “lessons learned” follow-up to the December guest post. I should be in touch soon. The lower viewing platform gives a great views of the falls, I love this angle ! How was the mist, not too bad ? Yes, that was a great location. The mist was a little bit of a problem, but not too serious Luck with wind direction plays a part. I had to wipe the lens a few times, but didn’t have to worry about the safety of the camera. The other concern about mist at big water sites like this is that too much of it can obscure the scene. There was a problem at the Devil’s Throat overlook on the Argentine side. I have a stupid question. do you use a regular cloth to wipe the lens ? I always get smears…. I had this problem in Iceland as well. We couldn’t see Detifoss waterfall due to the heavy mist (the waterfall is so powerful). Well, purists would probably have a cow, but since I have a clear filter in front of the lens, I often end up using what’s available such as my shirt. (Shreek!) On this occasion, however, I knew there would be mist and grabbed a bunch of tissues in the hotel room before we left on the bus and stuffed them in a pocket where they would handy. Seemed to work OK. Good point on Iceland, I’m heading there in September. I read all your posts and bookmarked them for reference. Any key tips? I hear that it is pretty windy there so I am evaluating my tripod strategy. Wow. Just wow! Jaw dropping! Thank you very much for visiting and for your comments. I’m glad you like the images. It looks powerful and picturesque! And it does not look alike in different parts. Beautiful set! Thanks, Alexander. I appreciate your comments. Yes, you’re right. The power was truly evident as we stood a few feet away from the edge of all that water going over a 200-foot high cliff. Nearly 4 years living in Brazil and I never saw the Falls, Robin. Thank you for taking me there with your images. Thank you. Hi, Dani, good to hear from you and thanks for the comments. Wow, those four years must have been interesting, but Brazil is a very large country so like the USA, it’s hard to see everything no matter how long one lives there. I’m glad you liked the images. Agreed, but it is one of THE things to do while there. Maybe next time we visit. Amazing, especially the last image. What an experience that was. Nice to see you managed to retain a positive attitude, I know how traveling in groups can be frustrating. 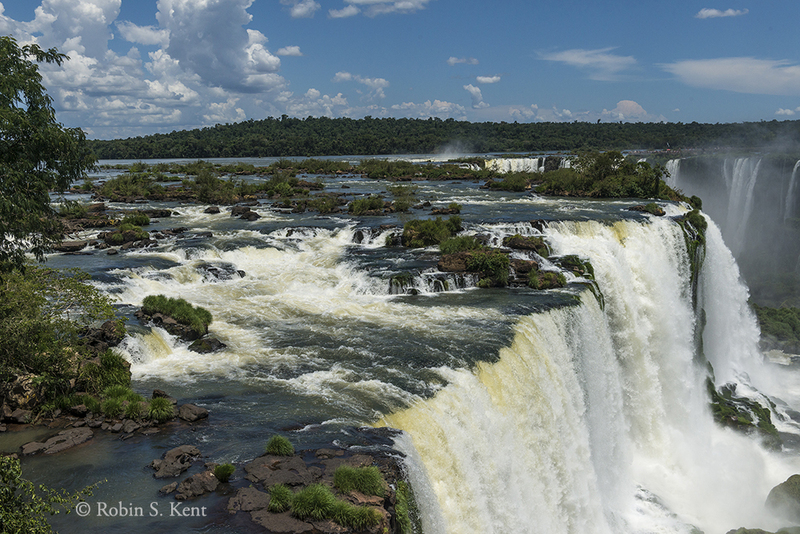 Iguazu Falls have a special place in my heart, because they are the part of my favorite movie of all times “The Mission”. I don’t know if it would meet my expectations, visiting that place with all the rush, surrounded by too many people. It is never like it’s in the movies, right? Thanks very much. Yes, the movies can do that. They have all those professional cinematographers with zillion dollar budgets and helicopters, etc. etc. Not to mention multiple days/weeks of shooting. What’s a poor photographer like us with one camera and 3 hours supposed to do about that? But I was lucky, I hadn’t seen that movie. But now, I’ll have to check it out . Still, if you can ever swing it and can somehow stay a little longer than we did, you’ll probably experience some moments that are special. Try to be in a good place at closing time; the animals know when that is and start coming out about the time the guards come through and start asking (nicely) for people to leave. It’s not that the falls are spectacular in the movie, it is the movie that is spectacular to me. If I could stand there all alone while Ennio Morricone’s music plays, that would be perfection. If I ever get the chance to visit, I will try to make the best of it. Just checked the soundtrack, I see what you mean. That music needs to be on my playlist. Thanks for the lead. Hi Robin, this is one of the most powerful and amazing sites you can be in America. The energy you feel at The Devil’s Throats is an impressive experience. Great post! Simply spectacular, Robin! The roar of the water must have been deafening….